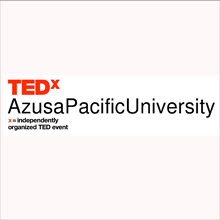 Azusa Pacific hosts its second TEDx event on Tuesday, March 28, from 12:30-4:30 p.m. at the Azusa campus. This independently organized, ticketed event, licensed by TED and sponsored by APU’s Center for Research on Ethics and Values (CREV), will feature seven APU faculty members and several TED Talk videos supporting the theme “Innovation.” For those unable to attend in person due to limited ticket availability, the TEDx talks will be streamed live. Learn more and follow updates on the event at tedxazusapacificuniversity.com. APU hosted its first TEDx event in 2015, featuring APU faculty and alumni. Launched in 2009, TEDx is a program of locally organized events that bring the community together to share a TED-like experience. Some of the best talks from TEDx events appear on TED.com garnering millions of views from audiences across the globe.